It should have been a short suspended-animation sleep. But this time Rose wakes up to find her past is long gone— and her future full of peril. Rosalinda Fitzroy has been asleep for sixty-two years when she is woken by a kiss. Locked away in the chemically induced slumber of a stasis tube in a forgotten subbasement, sixteen-year-old Rose slept straight through the Dark Times that killed millions and utterly changed the world she knew. Now, her parents and her first love are long gone, and Rose— hailed upon her awakening as the long-lost heir to an interplanetary empire— is thrust alone into a future in which she is viewed as either a freak or a threat. Desperate to put the past behind her and adapt to her new world, Rose finds herself drawn to the boy who kissed her awake, hoping that he can help her to start fresh. But when a deadly danger jeopardizes her fragile new existence, Rose must face the ghosts of her past with open eyes— or be left without any future at all. 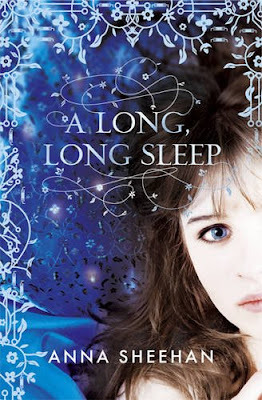 A Long, Long Sleep is one of those books that I hadn't heard all that much about before I was offered it for review so I went into it not quite knowing what to expect apart from loving the cover and deciding the premise was interesting enough for me to agree to review it. Little did I know how wonderful it was going to be. To start with for me A Long, Long Sleep was very much like Across the Universe. A girl who had been woken up in the future without any familiar surroundings or family to speak of. She is lost and confused and doesn't quite know where she fits in. I was a little worried at this point that the book was going to be a complete imitation but it wasn't as once you get past those first few chapters it does it own thing completely. The one thing I really loved about this book is the relationships Rose builds up with her new friends Bren and Otto and I love the contrast between the two relationships and what it says about how society judges people by their appearences. The story itself is very interesting and pacy. I loved following Rose as she tried to adapt to living in the new world she has found herself in and loved how she tried to just take herself away from it in the hope that everything would magically get better. The parts where she is being hunted done by the very menacing Plastine is quite harrowing at times and leaves you not quite trusting anyone in quite the same way as Rose doesn't feel she can trust anyone. The final section of the book where all the different revelations are made concerning all the different things the book has built up as it has gone along is awesome. I couldn't put the book down as the ideas and revelations were often quite jaw-dropping. All in all a satisfying book within itself which is fast paced and thoughtful with awesome characters and brilliant plot twists. While it does come to a satisfying ending I really hope that this book is a start of an epic series because there is so much that could be done next in Rose's world. I really want this one. I've read a lot about it -- but I haven't seen this cover -- it's much better than the one I've seen. I haven't seen many reviews for this - I love the sound of it though! Good the characters were all awesome - glad you enjoyed it! Fantastic review! I haven't seen this one before and when I read the blurb, like you I assumed it would be an Across the Universe mirror, but if it's not then I might have to check it out. Sounds really good. I'll be looking out for this one for sure.